The ESPER Chip system has been completely overhauled and this guide will give you some insight on the new functions. It is now possible to enchant your new ESPER Chips. There are 5 different chiptypes, Strong, Solid, Style, Special and Shiny. The ESPER Chips now have 5 levels and each chip represents a certain style of play, indicated by the color. 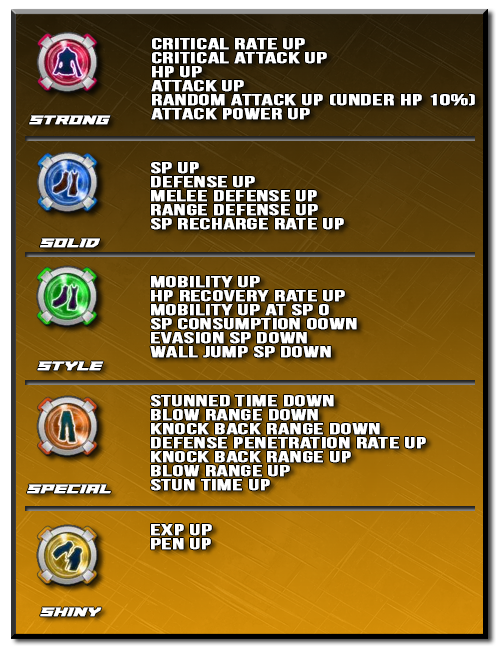 When you equip all 5 pieces in one Chiptype you get an Esper Skill, read more about the skills here! The following stats are possible on your new ESPER Chips and are acquired through enchanting the chips. You will be able to receive Chip Extractors in the game, these Extractors allow you to unchip an item and it will appear back in your inventory. If you override a chip in, the chip that was chipped in before will be lost. With the extractor you will be able to remove them from an item, if they are permanent. Old ESPER chips are still in the game and working, yet you will not be able to enchant them or extract them.